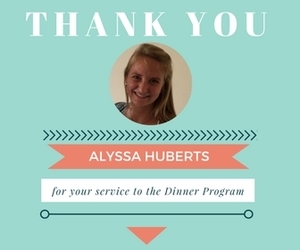 Please join us in thanking Alyssa Huberts for her amazing contribution to the Dinner Program Board and to the program as a whole. Alyssa joined the Dinner Program's Board of Directors in February 2016 and spearheaded efforts to establish and strengthen the partnership between the program and DC Central kitchen. She has been instrumental to the expansion of the program's job assistance efforts. Prior to joining, Alyssa assisted as a Spanish translator for the program's legal referral services. We are proud to announce that she will be joining Harvard's PhD program in the Fall.